Crown Alfa Romeo of Dublin provides the very best of service for your Alfa Romeo vehicle, with an experienced and competent service. They strive to complete your oil change quickly and correctly. Crown Alfa Romeo of Dublin's service team is also more than capable of answering your questions. Crown Alfa Romeo of Dublin is conveniently located to service drivers in the Columbus, Delaware, Dublin and Easton Town Center areas. This is just one benefit of choosing Alfa Romeo of Dublin for your next oil change. Our certified technicians help get you back on the road quickly while ensuring that the job is done correctly. If you aren't able to wait at our service center for your service to be completed, you can drop your car off and then pick it up once your oil change is finished. Crown Alfa Romeo of Dublin is committed to using genuine Alfa Romeo OEM parts in your oil change. The service team will replace your oil filter with another genuine Alfa Romeo oil filter to ensure your car runs well. This eliminates the worry of having incompatible oil filters in your car. 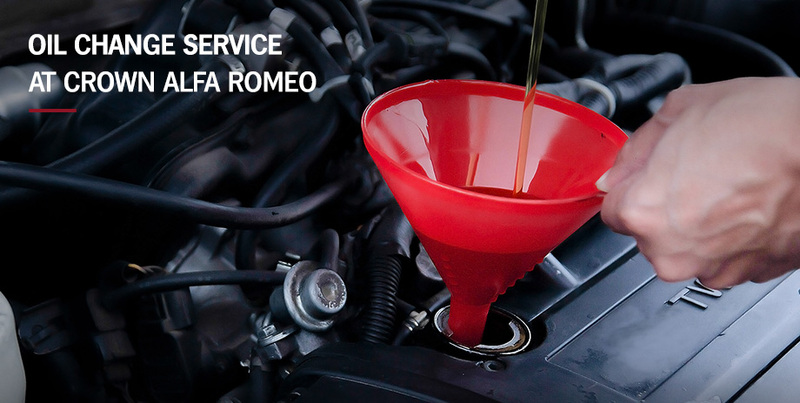 Experience excellent service by coming into Crown Alfa Romeo Service Center of Dublin today. Our service team is friendly and knowledgeable about all aspects of your Alfa Romeo vehicle. Crown Alfa Romeo of Dublin will make your next oil change a simple process. Drivers in Columbus, Dublin, Easton Town Center and Delaware can schedule their oil change here today.